I don’t know about you, but grilling has never been a “night off” from cooking. My husband manages the grilling, but I’m inside prepping vegetables and making side dishes. One of the best parts of these two recipes is that they actually taste better if they sit in the fridge. I can make these during the baby’s nap and then relax during grill time. Both of these recipes are full of vegetables (and fruits) and light on processed ingredients. Mediterranean Lentils could be a meal on its own, with all the plant protein lentils provide. 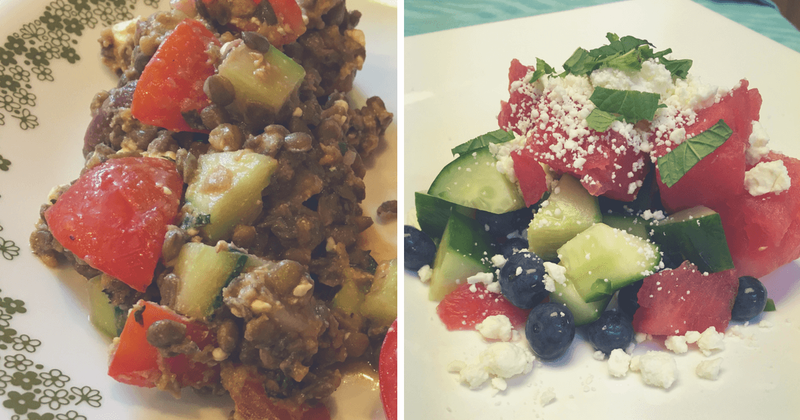 Double bonus, both of these recipes are vegetarian, gluten-free, no added sugars, and can be converted to vegan. They’re perfect to bring to a summer party or just keep in your fridge. 1. Cook the lentils according to the package instructions. Make sure you don’t overcook them! Mushy lentils do NOT make a good salad. 2. Put the onion in a bowl and cover them with the vinegar. Toss it all together and let it sit while you prep the remaining ingredients. 3. Chop the cucumber and tomatoes into bite sized pieces and add to a large bowl. Cut the olives in half. Finely slice the mint leaves. 4. Drain the lentils and put them in the fridge to cool. 5. When the lentils are room temperature, add to the veggies. 6. Take 2 tbsp vinegar out of the onions and drain the rest. Add the onion to the other ingredients and toss in the feta. 7. In a small bowl, whisk together reserved vinegar, oil, garlic, and mustard. Gently stir the dressing into the other ingredients and add salt and pepper to taste. Top with mint and enjoy! I usually cook the lentils a day ahead of time with my Instant Pot (I take a minute off the recommended cooking time, I like them al dente). I have a bad habit of letting beans and lentils burn on the stove. Also, it’s important to use green lentils for this recipe. Brown lentils have a tough outer skin and red lentils don’t hold their shape when cooked. Soaking the onions in vinegar pickles them little and takes away some of the bite. If you’re not a big fan of garlic, you could add it to the vinegar to get a milder flavor. You could also add some baby bell peppers if you want a little more color in this dish. 1. CAREFULLY remove the seeds and membranes from the jalapeno and finely dice. 2. Gently combine the ingredients in a large bowl and stir. I have to admit, I’m not a big watermelon person, but I like this recipe! If you love watermelon, feel free to adjust the cucumber:melon ratio (I just had a ‘90s Bath and Body Works flashback!). You could also add more jalapeno or leave the seeds in for a bigger kick. I have added a couple tablespoons of olive oil to make this more of a dressed salad, but I don’t see a big difference. Full disclosure, my kids don’t really like this dish. They prefer their watermelon as is, but life isn’t always about them, so I keep making it. You could make this a meal by adding some precooked shrimp, too! I love it next to grilled chicken, though. It really lightens up the meal. Hope you enjoy these two side dishes! Next month we’re taking a break from dinner to hook you up with some lunch box ideas. If your kids are anything like mine, summer has been one gigantic snack time. That eating schedule ends in less than a month! We need to learn some new ways to pack healthy, filling, and kid-approved lunches.